This title has dominated my days and nights recently since I first threw it into the PS2. With the amount of games that I am privileged to play, it's actually not that many that hold my attention as much as this one has. What's it about? Well let me tell ya! This brilliant game is a strategy title that is so far out of the box that it isn't funny. Why? Well for one, it's a strategy title that isn't boring! Secondly the perspective you get is totally different from what we've come to be used to. Your vantage point in this game is from a third person perspective, unlike the top down views of some other games. You control two teams being Alpha and Bravo respectively. The nice part of this game is the way that it forces you to think as a commander of two elite teams, using one team to provide cover for the other. The game opens with a training session that I thoroughly recommend you try out. The title is easy enough to play and the controls make sense and are easy to use, however they certainly are not intuitive and you will get drilled as soon as you try to play. The training does take a fair amount of time to get through, however it will make you all the more keen to get out there and have a good crack at it with the new skills that you are getting under your belt. I've only three complaints about this title and I will get them out of the way right now. As you can already see if you scrolled down, I'm still scoring this 7.9/10 so it really hasn't troubled me overall, yet I am compelled to report. First off there is only cooperative mode in multiplayer, add to that, multiplayer is only available with Live support, there should have been the option of one player controlling Alpha and the other controlling Bravo from a split screen perspective. As soon as I'd got into the game, I got a mate over to play and found out the hard way that we were not playing it together that day. Second, I thought there was not enough use of grenades on the part of the enemy. 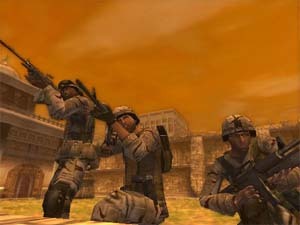 Many was the time when I could flush some of the enemy out or into oblivion with some well placed grenades. The emphasis is primarily about taking down an a static enemy for the most part and how you can utilise two trained teams to take out even heavily fortified structures. It's a damn clever game that I could not put down once I had finished. Finally having seen the Xbox version of this game I was actually fairly upset by how much the graphic quality of the title was dumbed down to run on the PS2. Whilst the graphics on the Xbox are absolutely sweet, the PS2 suffers from framerate chopping to the point that some of the gameplay is a little bit hard at times to make snap decisions in the heat of battle. That doesn't occur all the time though. 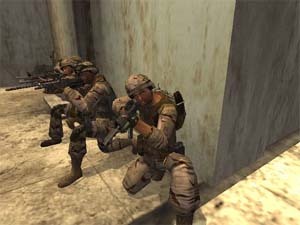 Action takes place in Zekistan, a fictional Middle Eastern Area where you are given assignments to clear out a certain area or take a person captive etc as you make your way through the action with your squads. There is a realism to the environments that really shows through, even on this version of the game. It's surprising the level of detail that has gone into making it as real as possible. Though when you take into account that Pandemic actually made this to be a trainer for US troops and then dolled it up for the rest of us to enjoy, it makes sense that the government would want to try to make environments as true to real life as possible. I would have to say that you should give Full Spectrum Warrior a shot, it's a tough call to make as I absolutely loved it, but I would have to say that the XBox version of it killed this one but that might have tainted my experience playing this. I'd have no troubles giving the XBox version of this game a 9.8 but I think that I have to go for a 7.9 on this version, and then even go so far as to say some might want to rent first. The experience is awesome but framerates and non coop modes might distance some from the game. Add to that the fact that you really are not going to play this over and over and it simply might not be an attractive proposition for a purchase.